�A chilly morning in early spring of 1918 and the pilots and mechanics roll out their Albatross D-V�s for an early dawn patrol. 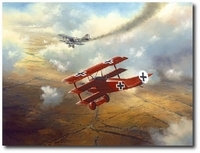 These are the colorful fighters of one of the most successful Jastas of the Imperial German Air Service: Jasta 5. The green tails were to carve out a niche of success that was the envy of those who flew alongside them during the Great War. We remember them today for their distinctive markings, which made them instantly recognizable to friend and foe alike. 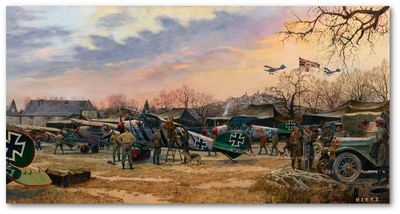 In this new canvas Gicl�e, James Dietz has sought to give us not only a view of these beautiful wings of prey, but packed the view with the mood and story of those days of flying adventure long since past.